The PS1020 product is a slim-design, DIN rail mounted Class I switching power supply featuring fully isolated plastic cases, extended operating temperatures from -20° to 70°C and 84% efficiency. 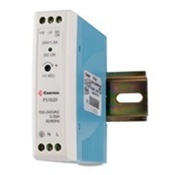 Standard features include short circuit, overload and over voltage protection, no load power consumption, and DC OK signal for monitoring status of the power supply unit. Package Dimensions4.3" x 1.1" x 4.1"